We are broadcasting from Washington state, where the Department of Energy declared a state of emergency at the Hanford nuclear site after a tunnel storing contaminated radioactive materials collapsed. The collapse, which was discovered Tuesday, forced hundreds of workers to take cover to avoid potential exposure. Hanford is the nation’s most polluted nuclear weapons production site. The site has been leaking radioactive waste on and off for years. The Energy Department claims no radioactive contamination has been reported so far from Tuesday’s tunnel collapse. But Edwin Lyman from the Union of Concerned Scientists said, “Collapse of the earth covering the tunnels could lead to a considerable radiological release.” Now the Washington state Department of Ecology’s Nuclear Waste Program has announced on Twitter that it has taken legal action against Hanford. We speak with Tom Carpenter, executive director of Hanford Challenge, which advocates for workers at the Hanford nuclear site. AMY GOODMAN: We turn now to our last segment, and we continue to focus on what’s happening at a state and local level that’s happening all over the country. Next week, we’ll be traveling throughout California and broadcasting throughout there. You can check our website at democracynow.org to see where we’ll be. 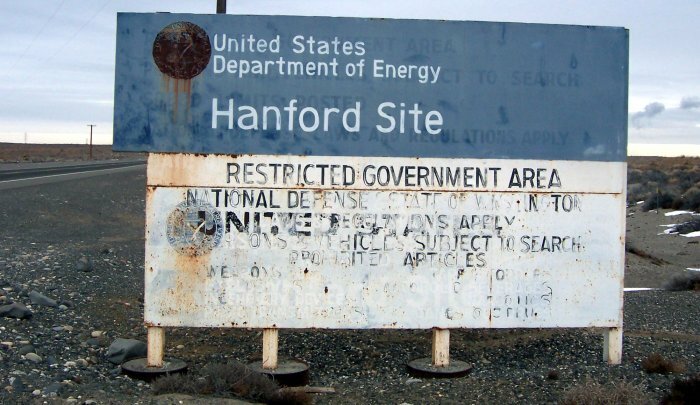 But right here in Washington state, where the Department of Energy declared a state of emergency at the Hanford nuclear site after a tunnel storing contaminated radioactive materials collapsed, is the subject of our last segment. The collapse, which was discovered Tuesday, forced hundreds of workers to take cover, to shelter in place, to avoid potential exposure. Local station KING 5 obtained this video from a worker describing the scene. PA ANNOUNCER: All personnel report to their respective lunchrooms for further information and/or instruction. All personnel should refrain from eating or drinking until told it is safe to do so. HANFORD WORKER: Well, so, it’s either a drill or an emergency. Gotta take cover. AMY GOODMAN: Hanford is the nation’s most polluted nuclear weapons production site. The site has been leaking radioactive waste on and off for years. The Energy Department claims no radioactive contamination has been reported so far from Tuesday’s tunnel collapse. But Edwin Lyman from the Union of Concerned Scientists said, quote, “Collapse of the earth covering the tunnels could lead to a considerable radiological release,” unquote. Well, now the state of Washington’s Department of Ecology’s Nuclear Waste Program has announced on Twitter it’s taken legal action against Hanford. For more, we’re joined here in Seattle by Tom Carpenter, executive director of Hanford Challenge, which advocates for workers at the Hanford nuclear site. Tom, welcome to Democracy Now! Explain what’s taken place. I mean, given what’s happening in Washington, D.C., there’s very little national awareness about what you’re dealing with here in Washington. TOM CARPENTER: OK, so this is the nation’s most contaminated site. In the state of Washington here, it was built to make nuclear weapons and plutonium for those weapons. And now we’re left with this legacy of radioactive waste. And so, what recently happened on Tuesday morning was one of the facilities at the site suffered a collapse of a tunnel, holding vast quantities of very highly dangerous radioactive materials. Now, the government is saying that none of that escaped, except, you know, radiation itself into the sky, but no particles escaped. And so, now the question really remains is: Is that true? Were workers contaminated? It appears not. But what is the next—you know, what is the next shoe that’s going to fall? So, what’s in this tunnel, right? So, we know that there are chemicals. There are explosive materials. There could be fires that happen. So we’re all watching with bated breath. AMY GOODMAN: Can you explain what the PUREX is, the Plutonium Uranium Extraction Plant? TOM CARPENTER: Yes. So, this was a facility that was used to dissolve spent nuclear fuel made in nuclear reactors on the shores of the Columbia River. They had nine reactors. And this facility would dissolve this stuff in acid, separate out the plutonium. And they had this very large inventory of highly radioactive and chemical waste products left over. That’s what’s at Hanford now. AMY GOODMAN: Can you explain the history of the Hanford site and its role in the U.S. nuclear program? TOM CARPENTER: Sure. Hanford was the first production facility that came out of the work at Los Alamos during World War II. So, it made the plutonium for the very first nuclear test in the deserts of New Mexico and was the plutonium dropped on Nagasaki, Japan, in the Fat Man bomb. So, it went on then to make more and more plutonium. And it does this by irradiating uranium slugs and then taking that irradiated uranium, dissolving that in a process called reprocessing. And Hanford became the most contaminated facility as a result. It’s hard to—it’s hard to describe exactly how bad this place is. It’s got two-thirds of the nation’s high-level nuclear waste. There are just 56 million gallons of this waste in underground, leaking tanks. This one little tunnel that was the subject of Tuesday’s collapse was really a small thing compared to what else is out at that site. So, you can imagine a collapse of a nuclear waste tank containing millions of curies of radioactivity. You’re talking about a multistate disaster. And those tanks are in no better shape than this tunnel. And that’s the concern, is that the federal government spent trillions of dollars to make nuclear weapons, but it’s shortchanging us on the cleanup at these sites. It’s supposed to take years and years. The money is being stolen. It’s a fraud factory, in a way. And, you know, so the public is really getting shafted on this one. AMY GOODMAN: So, very quickly, you have sued the federal government on behalf of the workers at Hanford. We have less than a minute. Can you explain what you have sued over, what you’re demanding and, with this latest accident, what needs to happen? TOM CARPENTER: OK. So we brought a lawsuit along with the union at the Hanford site, the pipefitters’ union in the state of Washington, to force the government to provide better protections for the workers out there who inhale chemical vapors and then get sick. And, you know, sadly, people are not being protected, even though there are some pretty grave health injuries that result. And we are demanding that people are protected with respiratory protection in the future and that they do something to protect these people. And, you know, this latest incident is a great illustration of how workers are on the front lines of harm out there. AMY GOODMAN: Well, Tom, I want to thank you for being with us, Tom Carpenter, executive director of Hanford Challenge, which advocates for workers at the Hanford nuclear site. This article has been republished from Democracy Now under the Creative Commons 3.0 License.